Combine classic Southern-style banana pudding with crunchy vanilla wafers in this Easy Southern Banana Pudding dessert. Follow this simple recipe today! Arrange half the wafers on bottom and up side of 2-qt. serving bowl; top with layers of half each of the banana slices and pudding. Repeat all layers. Cover with COOL WHIP. Save 60 calories and 3.5 grams of fat per serving by preparing with fat-free milk, JELL-O Vanilla Flavor Sugar Free Fat Free Instant Pudding, reduced-fat vanilla wafers and COOL WHIP LITE Whipped Topping. Garnish with additional banana slices, dipped in lemon juice to prevent darkening, just before serving. 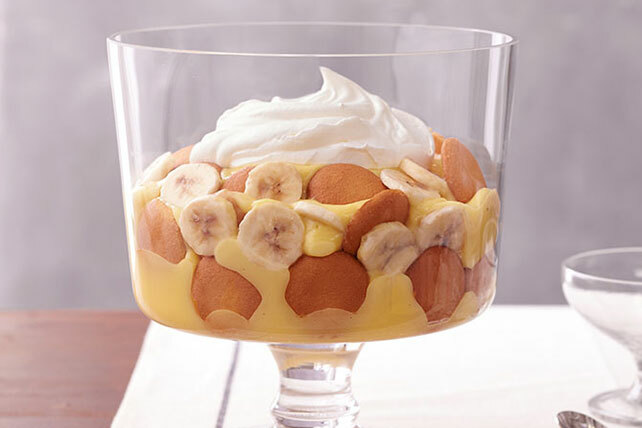 Check out our Healthy Living version of Easy Low-Fat Southern Banana Pudding.